Promoting 25, her first album in four years, Adele has appeared on The Tonight Show, Saturday Night Live and Today, as well as two hour-long specials for NBC and BBC. Her smash-hit “Hello” brought the singer back into the spotlight, and inspired hundreds of make-up tutorials for her signature retro look. Adele herself got in on the look-alike game with a prank, included as a feature on the Adele at the BBC special. The artist donned prosthetics and transformative make-up to become Jenny, an Adele impersonator, and was only discovered when she began to sing. Make-Up Artist magazine interviewed Kristyan Mallett, Adrian Rigby and Lisa Cavalli-Green—three key artists behind the transformation—for details, products and once-in-a-lifetime moments. We loved the “Adele as Jenny” prank! How did you get involved? And had you worked with Adele before? Kristyan Mallett: I have worked on many disguise shows here in the U.K. with many different production companies, and it was one of these companies that got in touch regarding this project. It was all very hush hush, I even had to tell my team that the make-up was for a pilot show, not a prank. We hadn’t worked with Adele before but when having the lifecast [made] she was very keen on having lots of fun with the make-up. Adrian Rigby: I was called by Kristyan Mallett to go apply the make-up on Adele, and to work alongside Lisa Cavalli-Green, to turn Adele into a version of herself. At that point I didn’t know too much about what was involved, just that it was a top secret project. I also knew BBC TV chat show host Graham Norton was part of it too, so I assumed it was part of his TV show. … I hadn’t worked with Adele before. ​Lisa Cavalli-Green: I was approached by the BBC to do a top secret job! I had three conversations before they told me who it was. 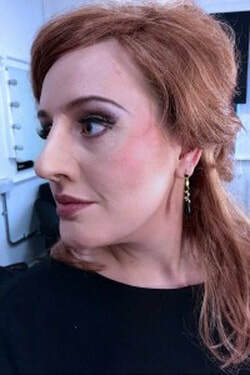 It was an extraordinary job to be asked to do, to make Adele look like someone else who was impersonating Adele! MA: She seems to be wearing a prosthetic nose, and mentions a chin. What types of prosthetics did you use? KM: We decided to keep the prosthetics to a minimum so we went with a nose and chin. Both distracting enough to make a difference. We made two options larger and smaller. The pieces were encapsulated Pro Gel pieces; production chose which ones they preferred and we then contacted Adrian Rigby, who fortunately was available to apply the make-up … He did a great job too. AR: Yes she was wearing a nose and chin. Two slightly different noses and chins were designed, one set more subtle than the other. It was decided to use the smaller set so the look wouldn’t be over the top but enough of a change to her face to make a difference. Lisa did a fantastic job and completed the look with a wig. MA: Who fabricated and applied the pieces? AR: The pieces were sculpted by Francesco Fabiani through Kristyan Mallett FX. I applied the pieces. MA: How did you differentiate the character Jenny from Adele? What products did you use? LCG:​ Adele has beautiful skin and really recognizable big eyes. I studied all the photoshoots she had done and decided to change the shape of her eyes and make her lips look smaller. 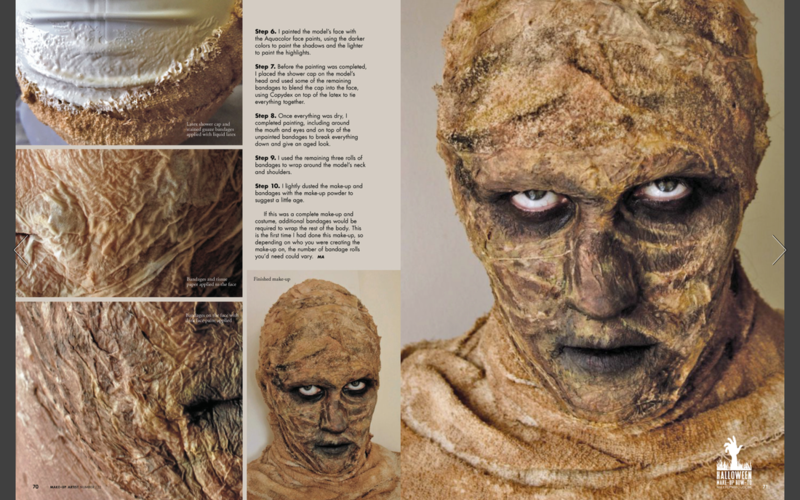 I​ had already been in touch with Kristyan Mallet—who made the prosthetics—and was delighted to see how much they changed her face when Adrian applied them. I needed to make her make-up look like someone who was “impersonating” her would do, so I tried to do it a little heavy handed; I didn’t want it too look too polished. The prosthetic nose already helped to make her eyes look closer set, so by making the eye shadow shading more rounded and higher on her lid I changed her eye shape. I used more subtle eyelashes that were more graduated than the type Adele wears, again this made her eyes look different. I used a Screenface eye shadow palette that has creams and browns, and a M.A.C. eye liner pencil in black. Shading helped to incorporate the prosthetic chin and change her face shape. I used Lancôme Color ID on her skin and over the prosthetics, it covers well but sadly is now discontinued. Then I contoured with Le Maquillage Professional which is so versatile. I outlined her lips smaller than her own with a M.A.C. pencil and used a M.A.C. lipstick to fill in, again using a darker plumy color that Adele would not usually wear. The wig was from my stock and looked close enough to represent the color she had her hair at one point. It was an acrylic as it had to be something that was available off the shelf. Again I didn’t want it to look too professional, so it was left fairly wispy. Adele has a tattoo behind her ear and she thought we should cover it, but I suggested I go over it with an eye liner so it looked like she had drawn it on; it was slightly bigger and worked well. MA: Were there any challenges? AR: With doing a make-up that has to withstand close scrutiny (in this case by the other Adele look-a-likes) the prosthetics had to be pretty much undetectable to the eye. Adele has flawless skin so we had to ensure the prosthetics looked good—to everyone but especially to her and they would withstand her singing. We also couldn’t get close to her most of the time as it would have given the game away. Fortunately the prank went off without a hitch and it was only discovered by the other “contestants” when she opened her mouth to sing. MA: What was the experience like? 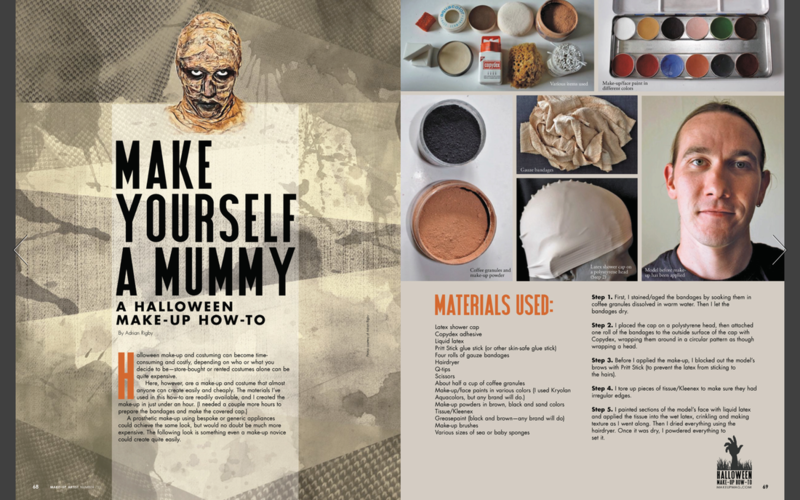 KM: With most pranks and last-minute publicity ideas that require prosthetics, they come with a very small turnaround time. But we often say yes to these projects as we really enjoy the challenge. Although it was only a nose and a chin it still involved several of my team members to fit this job into our already busy schedule of work. Overall a great fun little job done by a team of fantastic artists who I had the pleasure of working with. AR: It was a fantastic experience working with Adele. Definitely one to remember. Such a lovely person. During the make-up as she was getting into character, she played the backing track to the song she would be singing. She wanted to sing it in a slightly different way to draw the other Adele impersonators off the scent. So she began singing live to us, to practice—quite a surreal and wonderful experience. LCG: She was nervous at the idea of fooling people, but she was such a good actor. It was really moving when they realized it was the real Adele. During the make-up Adele sung to Adrian and me (well, she was rehearsing), but wow, we were thrilled! To be sung to whilst working by someone with such an incredible voice, such a privilege.